After a weekend of practice my left-hand fingertips always look like hell (see pic). Aside from just looking gross, the tough skin is catching on anything/everything. I can't be trusted near silk shirts or ties, it pulls the threads. Any tips for preventing or mitigating that? 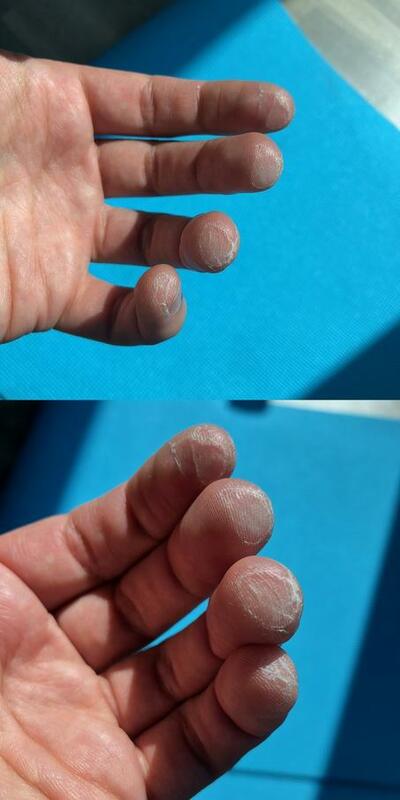 What I don't want is to moisturize them to a point where the skin is soft, having built up hard fingertips is what prevents pain and gives ability to play long gigs for hours. I just wanted to avoid the splitting and snags on everything, or at least an easier way to cut them off cleanly (trying with nail clippers but not good or tidy results). impress "L" by handling smoking hot skillets in your left hand, you can do it! Maybe use 2nd skin or take a day break, that usually works. Often when I take a day break I'll start conceptualizing ideas away from the guitar...hell I do that talking to my wife (I don't advise that for helping your relationship). Soak em in vinegar, let em dry out, and ALWAYS own a nylon string. Looks good! Like you were trying to slow down a bench grinder. Try Music Nomad string cleaner. Yikes...summat goin on. The most intense time I ever spent was 10-12 hours a day for a couple of weeks and my fingers didn't look anything like that. Wim - Do you find this happens more at a particular time of year? I know during a season change I often have chapped lips, etc as my body adjusts to the climate. You could try coating them with superglue and then buffing with fine sandpaper. I know a bass player who puts super glue on before every gig. Try surgical spirit, works for me. I wonder whether a super high tension/action might be the culprit here. The only time my fingers got chapped like that was after spending an afternoon with an archtop with a Freddie Green-style set up (action of at least 4mm, and 14 gauge strings).